We need to decide on the dividers that go into our book. 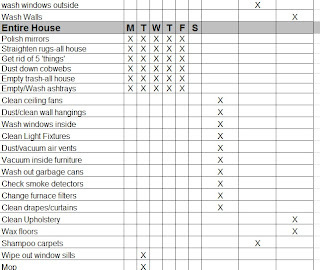 My divider is broken up into budget, meal planning, chores, emergency numbers, miscellaneous lists, calendar, address book, household information and personal information. The dividers are simply tabbed with "Budget," "Chores," etc. written on them. The picture gives a general idea but I couldn't get a picture with all the dividers showing. You might have different dividers depending on your family needs. (Like some of you might want a "school" divider. 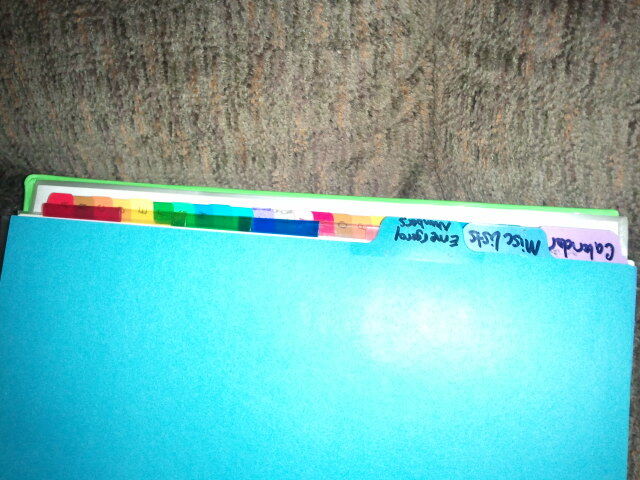 Just put all your dividers into the book. Each week we will focus on a different section in the book. This week we will focus on chores. Walk through each room with a pad of paper and pencil, writing down everything that needs to be done. You can download my lists to give you a jump start. The first thing you see will probably be that one spot in the room that catches everything. That is a 'hot' spot. Be aware of it and learn to understand it. For me it is the end of my kitchen counter. The two front entrances to the house meet at that corner. Mail, keys, sunglasses, coupons you name it, ends up in that spot. Doing your daily declutter and getting rid of 5 things from each room everyday will help that hot spot. Okay, this is where personalization comes in. I do not have kids at home anymore to make messes or to help clean the messes up. However, just my husband and myself do a pretty good job of creating messes that can easily get out of control. 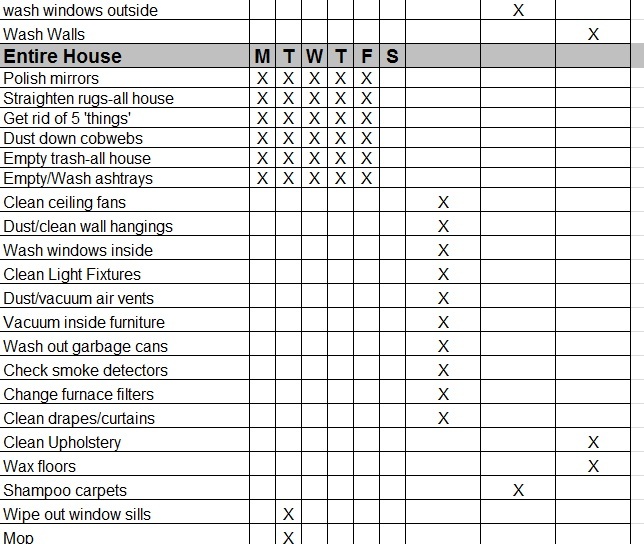 You can use my list as a guideline and if you know how to work with spreadsheets modify it anyway that you need to. After you have made your list you will need to decide how often each thing needs to be done. Daily, Weekly, Bi-Weekly, Monthly, Quarterly and Yearly. Click the image for an example. The last three columns are monthly, quarterly and yearly. You will see those if you download my spreadsheet. I am modifying my list while I am walking you through this. I don't need to clean my mirrors everyday and I'm changing that to once a week. But that is as easy as marking an X. If you do not know how to use or don't have spreadsheets, get some graph paper, ruler and pencil and make your own. It takes a little longer but as long as you use pencil it can be changed just as easily. Don't worry if it seems a little daunting when you look at it. Everything is written down, even the smallest little chore. Once you get into the hang of the system it shouldn't take more than an hour a day (not counting lawn/yard day) to get all your work done. Because of my health, no matter how much or how little I have done that day by the time dinner is done I am wiped out. The dishes usually get placed on the counter by the sick and wait until morning for me to put them in the dishwasher. My end of the day is 7PM. I will deal with whatever happens after that in the morning. You might not be done until 9PM or later. By all means get a jump start on the next day. It doesn't take long to get dishes done and then you will have more free time the next day. Once upon a time it's what I used to do. I wrote that paragraph for two reasons. 1. It's okay if something doesn't get done before bed. Just make sure you do it in the morning. 2. Even if you are without energy or strength you can still have a clean house. All it takes is starting somewhere. There was a time when I could do very little. Much less than what I do now. After we moved to Texas and I no longer had someone to help me I had to figure out a way to get it done by myself. So I am telling you, it CAN be done. I think I will end this post here. There are probably things mentioned that you have no idea what I mean yet but just keep following. It will all make sense soon.